Scarecrow is a music group hailing from New York. The lead vocalist, writer and producer is John Blaze. Scarecrow was originally formed in 1989 with Twisted Sister lead guitarist Eddie Ojeda. We first produced music videos for Scarecrow in the early 90s, live and concept. 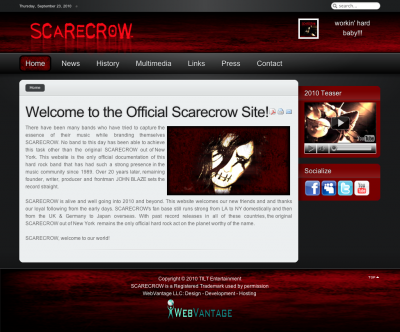 Since then we have worked on different web projects with Scarecrow and it's founder, John Blaze, including their latest website, ScarecrowWeb.com. Video production, Joomla! 1.5, Zoo, Socialize, Videos, Twitter, Document Downloads, Advanced Contacts with CAPTCHA, Forms, and more! I have known Cooch for almost 20 years. I have had the pleasure of being a part of his creative energy and have admired his amazing work that has been fueled by his passion for perfection. Over the years I have seen enormous growth in his creativity as well as technological advancements. Each project that I pitch his way, he hits it out of the park every time. Our latest venture was a website for a rock band. The site is super easy to navigate and visually stunning. From logo designs, website creativity, animation, design, production or hosting, Cooch and his company, WebVantage, can do it all better than anyone. Put your trust in his experience and your online presence will be one step ahead of the competition.